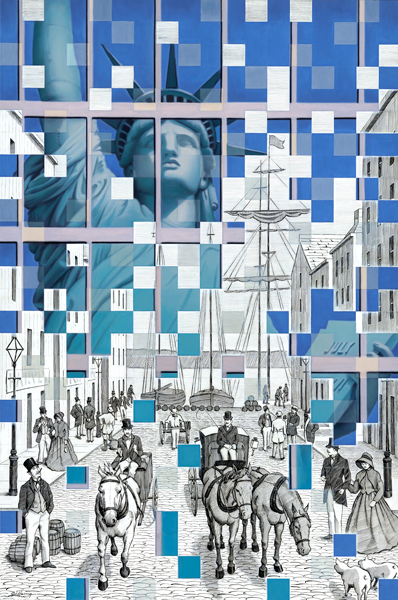 The Liberty Mural Project was created to celebrate the past, present and future of Lower Manhattan. As we enter a new Millennium, we are reminded of the foundations from which our city was built. It’s Colonial past, the seaport, shipping, banking, and its monuments all contribute to Lower Manhattan’s historic legacy. As visitors pass by this colossal mural, they will be reminded of the historic groundwork just beneath their feet. 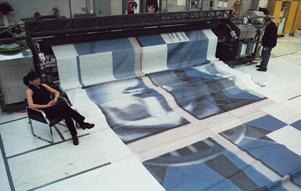 The project involved enlarging a 4’ x 6’ finished oil painting titled “Liberty” into a 75 x 50 foot mural and then installing this mural over a building at 59 Maiden Lane. The painting, created by Julie Harvey, is simple in its concept. It illustrates that our present was built upon the foundations our forefathers placed many years ago. The Statue of Liberty is reflected in the mirrored facade of a skyscraper. Areas of this colorful contemporary facade have been removed exposing a pen and ink drawing that describes the neighborhood’s lively past. 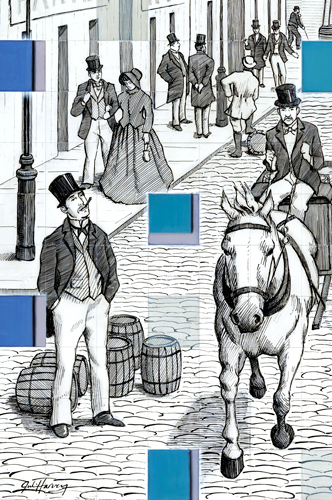 Early 19th century New York emerges revealing the cobblestone streets, horses and carriages, gentlemen with top hats, and ships in the seaport. Ms. Harvey has also included the old shipping barrels, lamp posts and even pigs that ran freely around Lower Manhattan. The Liberty Mural was presented to the community as a visual expression of the foundations from which our city and nation were established. Visitors and immigrants from around the world now sense the powerful display of hope as Ms. Liberty guards from above. 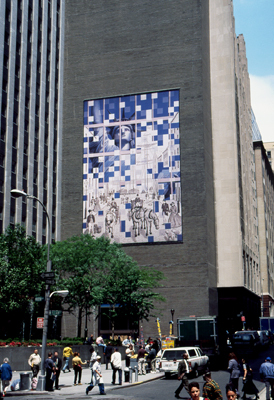 The mural hangs high near Liberty Street and Maiden Lane and reflects Lower Manhattan’s historic past while proudly looking toward the Millennium.